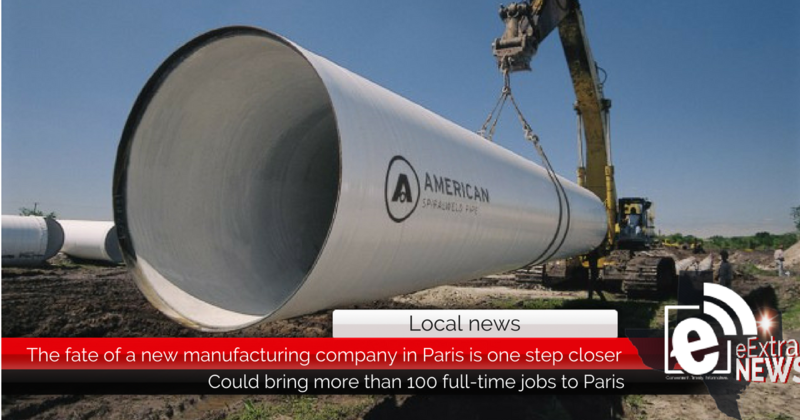 Paris Economic Development Corporation is set to ask the city for approval of revised incentives to entice American Spiral Weld Company to come to Paris. Paris said cash would be given upfront to the project at $2.5 million. He said $500,000 would be from PEDC for rail and $1 million will be funded from a loan from local financial institutions to the company for each employee of ASW. Another $1 million will go toward the institution after a threshold has been met. That threshold, he said, has not yet been set. In December 2017, Paris City Council unanimously approved PEDC’s request to offer a $1.28 million incentive package to American Spiral Weld Pipe. The million-dollar incentive package includes land. Formally known as Project Orange Fire, the addition of ASWP could bring 120 full-time jobs; each with an average salary of about $51,000.